I'm always a sucker for a good appetizer at restaurants. In fact, I often find myself ordering an appetizer for my entree when I'm out. The portions and calories are better, the flavors are often more adventerous, and the price is just right! These simple little dandies are SO easy to make and the sauce just punches you in the face with flavor. You can also play with the shape of the wontons on these. I made some of them dumpling style (shown) and I also folded some over into triangles to make ravioli. Those got eaten before I could photograph them! Heat a large skillet to medium heat. Add the chicken sausage, scallions, garam masala and fresh mint. Stir until combined. Break sausage up into tiny bits as it continues to cook for about 7-10 minutes, until browned and cooked through. Remove from heat and set aside. Press one wonton sheet down into the center of each of the mini muffin tins, creating a small cup. Spoon about 1 teaspoon of the sausage mixture into the cups. 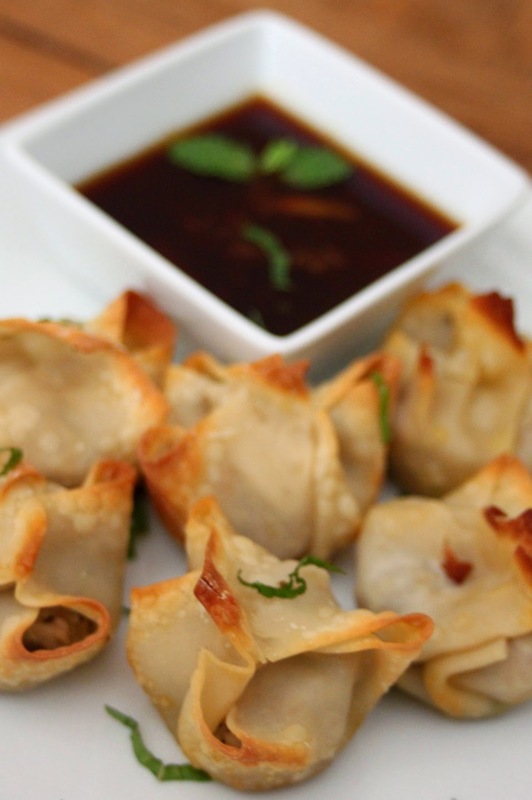 Use wet fingers to pinch the corners of the wonton sheets together and close the cups. Spray all the wonton cups with non-stick cooking spray and bake in the oven at 375 degrees for about 15-20 minutes until golden brown. Remove from heat and allow to cool for 5-10 minutes. Transfer to a serving dish and garnish with additional chopped mint. For the sauce: In a small saucepan, combine soy sauce, sriracha and orange marmalade. Stir until combined and cook on medium heat for about 5 minutes, until the marmalade is melted and the sauce is warm. Transfer to a dipping bowl and serve.